Milwaukee M18 FUEL™ Hedge Trimmer’s robust design provides unmatched durability and longer life. This is the second tool I have had the pleasure of using in Milwaukee’s new M18 FUEL™ range (a line trimmer and blower are also available). Milwaukee is well known for quality and performance with its battery-powered products for the building and construction industry. 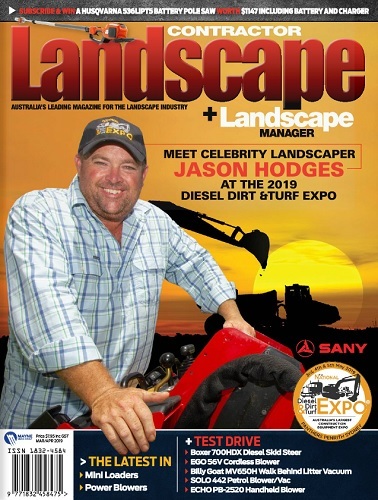 The new range has seen Milwaukee branch out into the landscape maintenance industry. The M18 FUEL™ Hedge Trimmer has a double sided 24-inch cutting blade, which provides good reach and ensures efficient cutting. The blade’s long length means branches up to 17.5mm diameter can be cut with ease. A solid plastic cover fits over the blade for transport and storage. This cover is much better than most that are softer and open on the top, disfiguring quickly making them hard to put on. The Milwaukee cover encases the entire cutting system and is more robust. When I operated the hedge trimmer it was light (3.4kg excluding battery) and well-balanced, which made manoeuvring in and around plants easy. It gave a neat, clean cut and the electric motor stopped the blades instantly when I released the grip on the trigger, which means it is safer to use than its petrol-powered competitors. Two safety levers must be pressed in conjunction with the trigger in order for the blades to operate adding to the safety of this tool. One lever is located on the front loop handle and the other is on either side of the trigger handle, allowing the operator to use their left or right thumb depending on how they are holding the machine. A swivel rear handle wouldn’t go astray, but as yet I have not seen one on any battery-powered hedge trimmers. 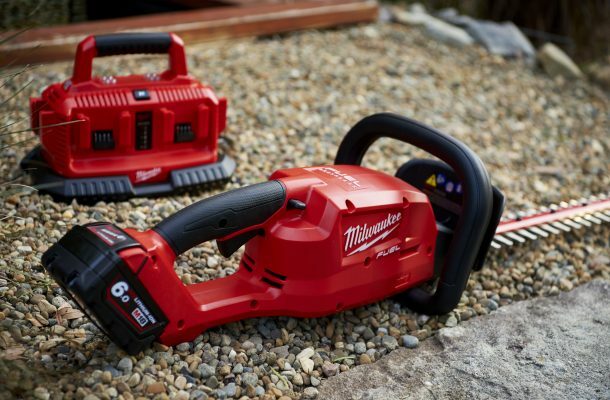 The hedger is powered by Milwaukee’s own industry leading POWERSTATE™ 18 Volt brushless motor, which the company claims has longer motor life, more power and more runtime than its competitors. I tested the unit with the 6.0Ah battery (also available is a 9.0Ah battery that runs the hedger for up to two hours of cutting). A second battery would be required to operate in a commercial situation and this is easily taken care of with Milwaukee’s six-battery charger. This charger has a carry handle making transporting and storing multiple batteries a simple task. An LED battery charge level indicator on the rear of the battery enables the operator to check charge levels with the push of a button illuminating the four-light indicator for quick, easy-to-see battery power checks. The new Milwaukee M18 FUEL™ Hedge Trimmer is a competent machine, ready to take on petrol-powered equivalents with the added advantages of clean power, no exhaust emissions for the operator to deal with, no messy fuel mixing or refuelling, reduced maintenance and the ability to operate at any time on noise-sensitive sites.